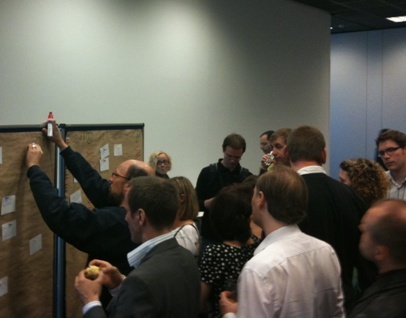 A rapid feedback on the last day of the Agile Testing Days conference, that took place last week in Berlin. On the agenda : 3 keynotes and an Open Space Technology through the day. I could attend only two of them. 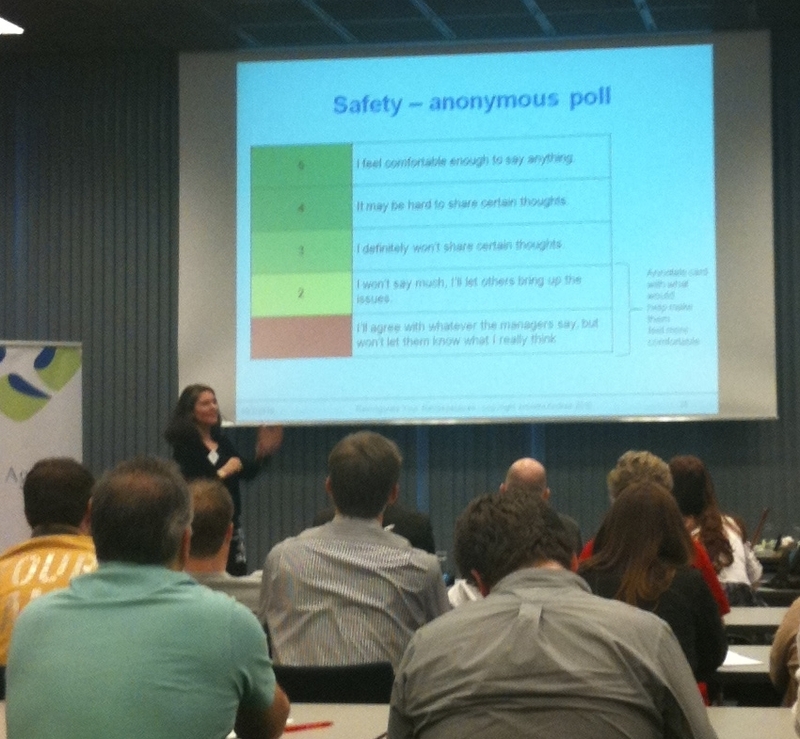 Isabel Evans discussed primarily the new skills of the testers and what is needed to acquire these skills. rewards, self motivation, commitment, and HARD WORK! In summary, we need to enlarge the skills of testers. Jennita began his keynote with a little game : « 45 seconds to change 5 things ». The instructions: change 5 things while back 2 back to a partner, then guess what your partner changed. Then she introdued the « Jenga Game ». According to her, this game is a good metaphor for software development. So the keynote focused on retrospective, and as a coach and facilitator, it’s always good to hear other practices and potential new exercises. Jennitta delivered her retrospective skeleton. It’s crucial to align individual perspectives to the Same Goal. Jennitta likes to start in a big circle, and continues with appreciations. (this is the reason why I use the checkin exercise with teams ). Various exercises can be used for the discovery activity, Jennitta discussed the timeline exercise and the different ways to build it. Where do we want to be? How do we get there from here. She discussed various forms of prioritization. According to me, the action plan is the main OUTPUT of the sprint retrospective. Nothing’s really new, it looks like my own retrospective structure but it was interesting. 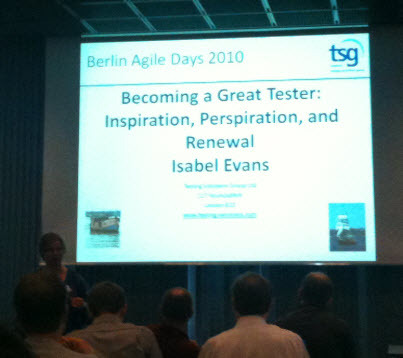 … for the first time on the Agile Testing days. 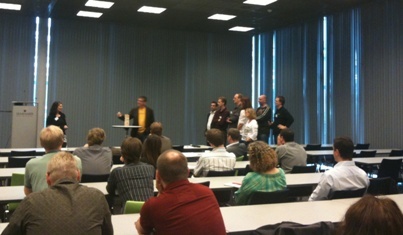 You know that I like the OpenSpace Conference format very much. I like to organize the event, I like to facilitate it … and I like to participate. It is a special time to discuss the topics that are important to us. I was interested in two sessions « Scrum of Scrums – Improvement communication in distributed large teams » and « Lightweight specifications ». Results: interesting discussions with a small number of participants. 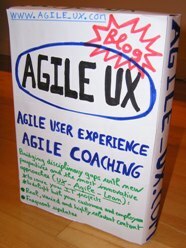 For the « usability testing » session, we were only two, Andreas and me but it was late in the afternoon. with highly motivated people who proposed various and interesting topics. Then, it was a little more chaotic with a lack of information given to participants, and a apparent lack of preparation (rooms, schedules, facilitation). But sessions were good, and all the participants were very satisfied. It’s the most important. Nevertheless, I think the OpenSpace day of the conference can be improved : maybe with « the good level of structure to promote grow » (in terms of information, logistics, timing and facilitation), and probably with a better coordination with lunch and keynotes.